A Japanese vegetarian and vegan udon noodle soup recipe inspired by the flavors of Asia. The secret in this recipe is the intensely flavored broth which is made from ginger, rice vinegar and soy sauce simmered together. Along with the udon noodles, this Japanese-inspired soup is made with Chinese broccoli, scallions, fresh cilantro and topped off with peanuts. It's quite similar to a traditional recipe and a traditional Japanese meal, so you won't find it as filling as say, a baked lasagna or a veggie burger and fries, but I personally find noodle soups, such as this one, to be perfectly filling. 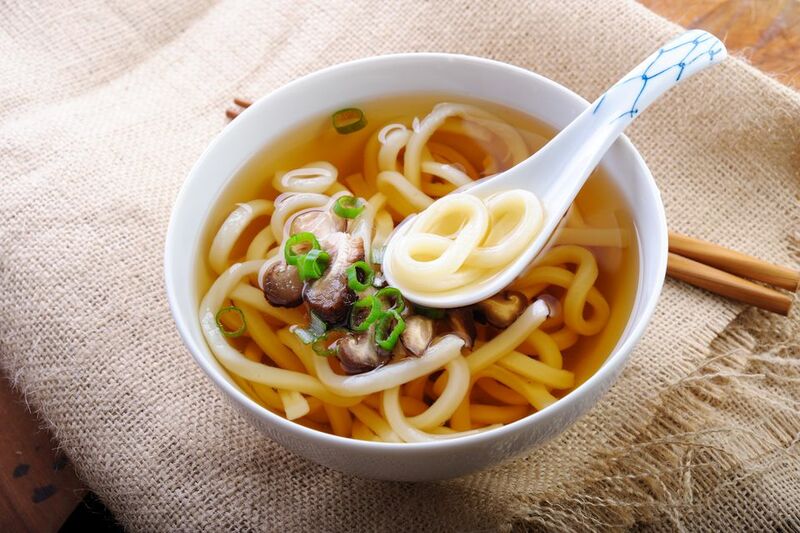 This Japanese udon noodle soup recipe is vegetarian and vegan. If you like trying homemade Japanese foods, scroll down for more vegetarian and vegan Japanese food recipes to try, including tempura, miso soup, sushi, noodles and more! Combine the vegetable broth or vegetarian "chicken" broth, two one-inch pieces of ginger (not the minced ginger), pinch of sugar, rice vinegar, soy sauce, vegetarian oyster sauce and chili paste in a large pot, stirring to combine. This is the broth for your udon noodles. Bring this broth mixture to a boil then cover the pot and reduce to a simmer. Allow the broth to simmer for at least ten minutes (longer is just fine), then remove the chunks of ginger from the broth and season lightly with a bit of salt and pepper. You can discard the ginger. In a separate large skillet, heat the minced ginger and garlic in the peanut oil for 2-3 minutes, then add the chopped broccoli and sesame oil. Sautee for a few minutes, until the broccoli is just tender. If you're ready to eat right away and serving several people, you can prepare individual servings by pouring a portion of the broth, the broccoli and a portion of noodles, then topping off the individual bowls with green onions, fresh cilantro and toasted peanuts. Otherwise, combine the broth, broccoli and udon noodles, and top with the green onions, cilantro and toasted peanuts just before serving. Enjoy your Japanese udon noodle soup! Note: Although this recipe calls for udon noodles, you could instead use another Asian-style noodle such as soba noodles or even homemade egg noodles.